Pastor Ron will be in the office on the first Mondays of each month. Will begin Sunday, March 6th at 10:00 a.m. We are asking for volunteers to teach the kids or adults on a monthly basis. Dusty and Donna have volunteered for the month of February. Also, if you would like to volunteer to bring snacks for the Sunday School, please speak with Barbara. Will resume today, May 8th at 2:00 p.m. with the 3rd part of series. Christ Lutheran Church met in members houses in Elk City prior to the completion of the church building in 1957 at its current location. As a member of the Lutheran Church-Missouri Synod the congregation’s mission is to spread the Gospel of Jesus Christ and the Christian faith by preaching the Word of God, administration of the Sacraments, and by the religious instruction of youth and adults, according to the confessional standard set forth in the Book of Concord. Our congregation acknowledges and accepts all the canonical books of the Old and New Testaments as the revealed Word of God, verbally inspired, and acknowledges and accepts all the Confessional Writings of the Evangelical Lutheran Church contained in the Book of Concord in the year 1580, to be a true and genuine exposition of the doctrines of the Bible. These writings include the Three Ecumenical Creeds (Apostles’, Nicene, and Athanasian), the Unaltered Augsburg Confession, the Apology of the Augsburg Confession, the Smalcald Articles, Luther’s Large and Small Catechisms, and the Formula of Concord. Christ Lutheran serves the local and surrounding communities of Elk City, an area that depends largely on the oil field. We are a small congregation dedicated to family ministry and being available to the many different people commuting into Elk City to work in the oil field. 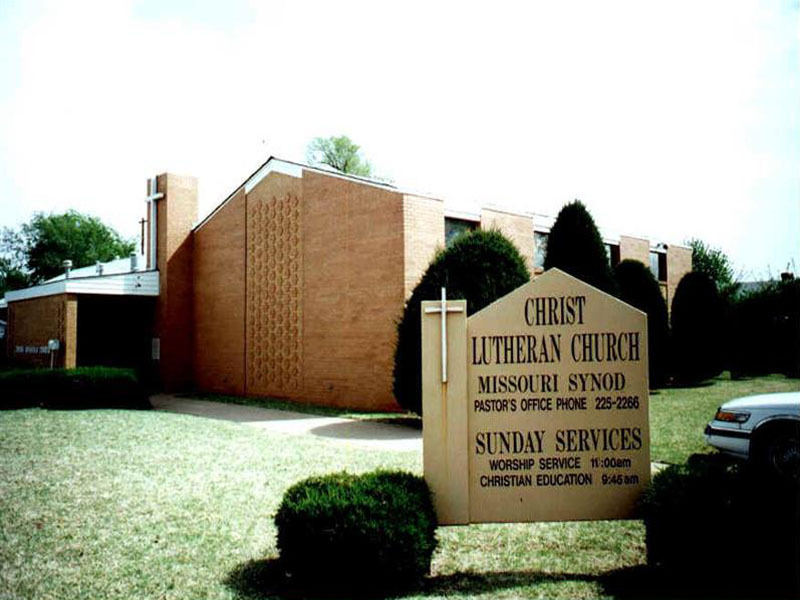 In 1990, Christ Lutheran joined Lutheran Ministries of Southwest Oklahoma, an organization partnering us with two other Lutheran Congregations throughout Southwest Oklahoma: Faith Lutheran in Altus and St. John’s Lutheran in Lone Wolf. All ministries focus on the mission of “Caring for people in such a way that they meet Jesus.” If you would like to learn more about us, please feel free to contact us.